Over the past few years, the city of Seattle has committed to a master plan for biking and committed to spend almost a billion dollars over nine years for bicycle and pedestrian improvements. In 2016, Seattle ranked 5th for the bike-friendliest cities in the U.S. according to Bicycling (Dille, 2016). Naturally, the City wanted to experiment with bikesharing in 2014. Over the past four years, Seattle has had an up-and-down hill battle with bikesharing. It originally started with a docked bike share operated by a private company, to have the City buy the operation to save it, only to discontinue it shortly after. Seattle didn’t want to give up on bikesharing though, so SDOT created a pilot program which allowed for dockless bikeshares to be operated by private companies with flexibility and freedom to innovate. The goal of this article is to reflect on winding journey the City of Seattle has undergone and to identify the smart moves the City made and which areas need improving. Seattle launched a docked station based bikeshare called Pronto! which was operated by Motivate from 2014 to 2017. Over the three years, the program did not gain nearly as much ridership as hoped. “In Pronto’s! 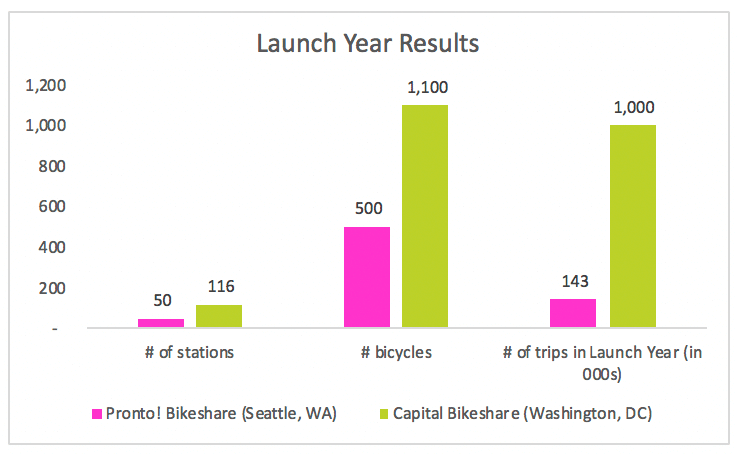 2014-2015 launch year, the system of 50 stations and 500 bicycles saw 142,846 trips” compared to Capital Bikeshare’s (Washington, DC) launch year with over 1 million rides across 116 stations and 1,100 bicycles (CityLab, 2017). Pronto! 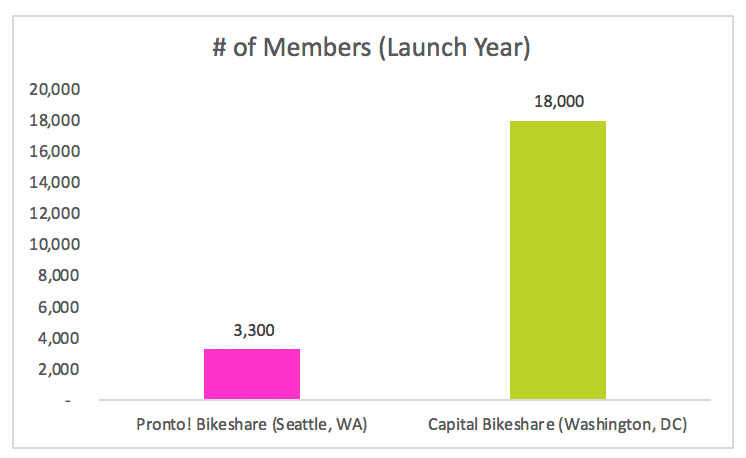 had 3,300 members while Capital Bikeshare had over 18,000 members. Exhibit 1 below showcases the stark difference in results. There are many cited reasons for Pronto!’s low ridership: the hills, weather and helmet laws. Seattle is a very hilly city which makes it unattractive to the average rider. With helmet laws, this acts as a barrier for people to join them program because many people do not like wearing them. Other people mentioned the location of the stations were not strategic and did not accommodate for common routes which could be another reason for low ridership. Other citied reasons for the Pronto’s! failure include lack of transparency that involved an ethics violation and lack of funding due to sponsors pulling out (apolitical, 2018). The failed docked bikeshare cost the City $2.2. million dollars (DeMay, 2017). Despite the failure, SDOT didn’t give up. The easy route could have been to eliminate bikesharing from the City but it found the courage to try again. In July 2017, SDOT took a unique approach and decided to introduce the “nation’s first private free-floating bike share marketplace” (Seattle Department of Transportation, 2017). The pilot would not require any capital investment by the city, saving taxpayers money, and instead passed the costs onto the bike-share companies. In turn, these companies would be given freedom to innovate (within reason). The City outlined regulations such as “safety requirements, parking rules, minimum service levels…and [ ] an open line of communication” (Lloyd, 2017). Most importantly, SDOT worked with these companies to ensure public policy goals were fulfilled. Allows the City to remain nimble and make changes to permit requirements based on findings throughout the pilot program. Ease of doing business (i.e. quick and easy application process, low cost to entry) attracts competition. With more competition, this benefits the end-users because competitors must compete with one another by continuously innovating. At project launch, Spin and LimeBike were the two operators. Ofo, a Beijing-based company with global operations, joined the pilot in August 2017. Private-public relationships can be tricky to navigate because goals can be opposing; private operators want to provide an exceptional user experience while making profit while municipalities want to provide services that is accessible to everyone. There can be conflict with these goals because economically distressed neighborhoods do not generate significant profits and the operators would rather focus on other areas. The needs of both parties were balanced by SDOT letting private operators launch in service areas with high density and higher-income neighborhoods first but also requiring they service economically distressed zip codes (SDOT, 2017) as the bikeshare operation grows. Pain-points during the pilot. Acts of vandalism and illegally parked bikes were some of the nuisances for this pilot. LimeBike, Spin and ofo had to issue warnings to riders in spring of 2018 that brake lines were being cut (Nickelsburg, 2018). Another challenge operators faced was illegally parked bicycles. One of the best features of a dockless, free-floating bikeshare is that it gives people the freedom to start and end their trip virtually anywhere in the service area. Under Seattle’s bikeshare pilot, riders are supposed to park the bikes in a “paved furniture zone area, avoiding the pedestrian path, curb ramps, and corner areas” (SDOT, 2017). Unfortunately, this did not happen in practice. Some users would park their bikes incorrectly which resulted in bikes blocking sidewalks and bus access. This is a hazard to pedestrians especially those with mobility issues. Some bikes were also dumped in parks, water bodies and train tracks. SDOT wanted to learn how big the issue and found that “70% of bikes were wholly compliant with permit parking guidelines, 26% were non-compliant but not impeding access, and 4% were non-compliant and impeding access” (SDOT, 2017). Unfortunately, when bikeshare operators received the complaints a resolution was not always done in a timely fashion. Lessons Learned: Be proactive, not reactive. One of SDOT’s takeaways is to enforce vendors to be proactive in managing parking compliance. It is not effective to rely on a complaint-response mechanism. Perhaps another way to improve parking compliance is re-assessing the fleet size rollout. During the pilot, operators to 500 bicycles for the first month of pilot, 1,000 for second month and 2,000 for third month of the rollout (SDOT, 2017). movmi is in favor of rolling out your service gradually because if you commit too much too early, it will be time-consuming and costly to fix any mistakes or changes you want to make. SDOT could improve this method by having ‘gate reviews’ where it assesses how effectively operators resolve illegally parked bikes before allowing operators to expand their fleet. SDOT wanted to keep track of the operators’ bikes in real-time and received anonymized user demographic data; however, bikeshare companies were concerned about sharing specific data with their competitors. The solution? Bikeshare companies could provide data to the University of Washington’s data collaborative (Lloyd, 2017), which acted like a kind of data clearing house, so that specific data was not shared with their competitors. There were a range of goals with some revolving around ridership, geographic coverage, public opinion and financial costs. Thus, various quantitative and qualitative methods are needed to access these goals which is what SDOT did. The pilot concluded in December 2017. 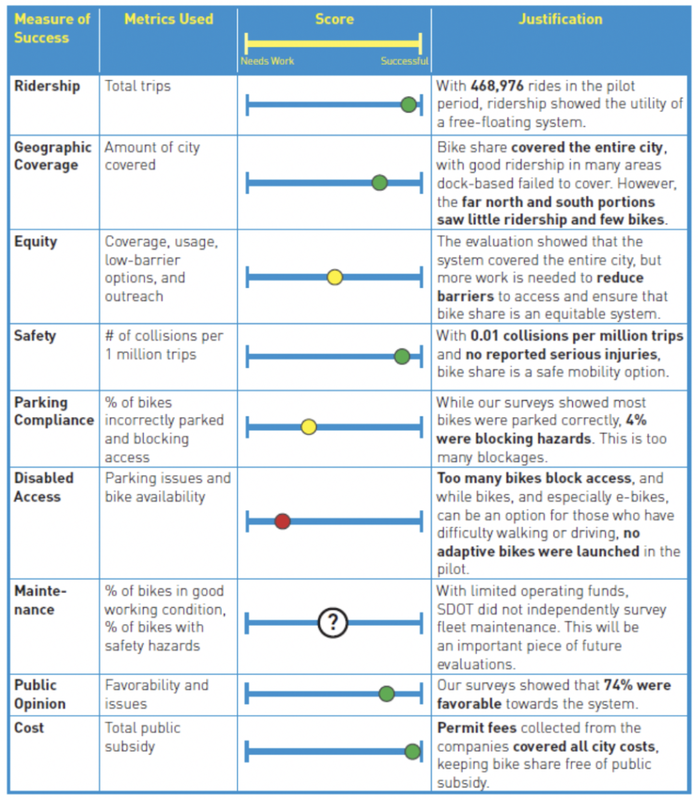 In August 2018, SDOT released the results of the 2017 Free-Floating Bikeshare Pilot. To read the full report, click here. Overall, the results of the pilot were overwhelmingly positive. “Across the three companies, 468,976 total trips were taken in the 5.5 month pilot period, averaging 2,791 rides a day. This is almost ten times more trips taken than during the same time frame in 2016 with Seattle’s decommissioned dock-based system, Pronto!” (SDOT, 2017). The study also predicts that ridership will continue to increase as the bikeshare fleet and service area increases and when weather improves too. Figure 5 depicts this below. One of the key findings from the study notes the importance of using the right metrics. Typically, bike share success is determined by rides per bike per day. Seattle found that daily trip counts and trips per 1000 residents were better metrics. Another metric that could be improved is measuring how far users rode on average (2.2. miles). Unfortunately start and end locations were only measured – no mid-way data was taken. There is also opportunity to conduct more sophisticated analysis with the GPS bike data points collected for city planners, of which, SDOT is hoping to capitalize on in the future. Who uses bikeshare and what for? The user survey and city-wide survey found that bikeshare users are predominately male and between the ages 25 to 44 years old. Racially, bikeshare users are diverse and more research is needed to draw conclusions. Bikeshare trips are used for a variety of reasons such as “utilitarian trips, first- and last-mile access to transit, commutes, and recreational trips” (SDOT, 2017). Approximately 75% of respondents said they used bikeshare to connect to another transportation options. This suggests that bikesharing is complementary to public transit and not supplementary. The pilot study revealed that 70% of routes didn’t “lose or gain more than 50 feet of elevation” (SDOT, 2017). 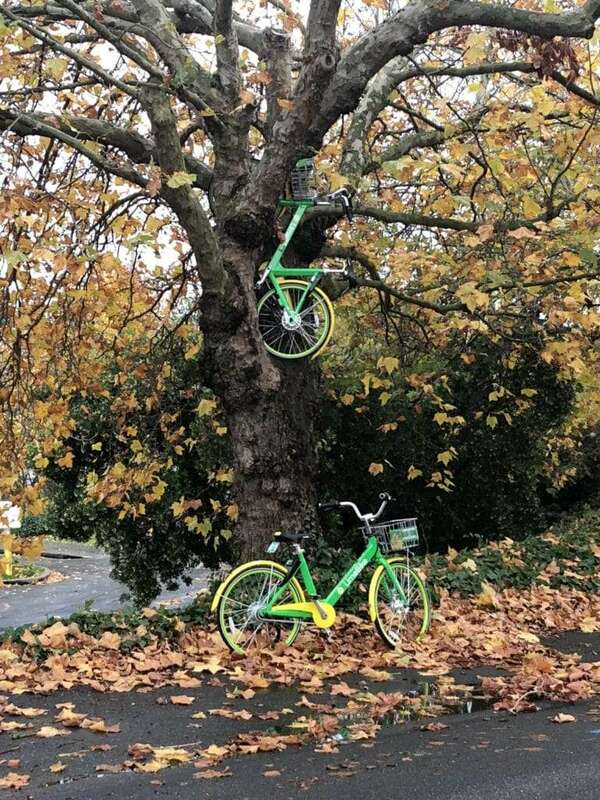 LimeBike tried to alleviate this problem by launching e-assist bicycles in Seattle to give users the option to utilize other Seattle routes. Unfortunately, the e-assist bicycles were used after the data collection period for this study. To service outlying neighborhoods, bikeshare fleet sizes need to hit a critical mass. As demonstrated in SDOT’s Evaluation report on page 23, their figures show increased fleet sizes (and in turn, increased bikeshare availability) opened up services in various neighborhoods. *This is an interesting finding because 85% of unsolicited comments were negative but surveys showed people had mostly good things to say about it. As taken from SDOT’s 2017 Free-Floating Bike Share Pilot Evaluation Report on page 43, the exhibit below summarizes the operational results from the pilot. One interesting move SDOT made after the pilot is that it changed the cost for bikeshare operators to service Seattle from $1,800 plus $15 per bike to a flat $250,000 fee. movmi is unsure how this $250K price-tag came to be and is concerned that it will not make economical sense for bikeshare operators to participate. ofo was the first company to pull out citing the high price tag as its reason. It should be noted that the company is pulling out of other U.S. cities though (Griswold, 2018). Recently, Spin announced that they pulled out of the Seattle market because of the high price tag. But, Spin is changing its business model and shifting to an electric scooter business (Mynorthwest Staff, 2018) so now the company is not eligible to participate in the program. Currently, LimeBike, Uber-owned JUMP and Lyft-owned Motivate have submitted permit applications (Fucoloro, 2018). Overall, movmi likes how SDOT used a customer-centric focus that was flexible and adjustable as the pilot went on. It recognized that it’s better to get something done rather than being perfect. This pilot program showed how public-private relationships can work together and come up with creative solutions that work for both parties such as: using the university for data-sharing, permits to allow for flexibility and speed-to-market and prioritizing neighborhoods to be serviced. Given the success of this bikesharing pilot, we’re excited to see what SDOT takes on next – is a scootershare pilot in the foreseeable future? If you’re thinking about launching a bikeshare program, be sure to check out our blog post that teaches you how to do it step-by-step. Apolitical. Why good policies go wrong: Seattle’s botched bikeshare model. Apolitical Group Limited. CityLab. The Four Horsemen of the Bike Share Apolcalyse. 2017. CityLab. DeMay, D. Seattle bike share done Friday, cost city over $2.2 million. 2017. Dille, I. The 50 Best Bike Cities of 2016. 2016. Bicycling. Griswold, A. Bike-sharing company Ofo is dramatically scaling back in North America. 2018. Quartz. Lloyd, S. How did Seattle’s bike-share pilot go? 2018. Curbed Seattle. Lloyd, S. City of Seattle rolls out rules for private bike shares. 2017. Curbed Seattle. MyNorthwest Staff. Why Spin bikeshare decided to pull out of Seattle. 2018. MyNorthwest. Nickelsburg, M. Ofo joins Spin and LimeBikeBike warning Seattle riders of brake lines deliberately cut. 2018.